Susan has her BS in Early Childhood Education from Wheelock College. At her last job she was the Director of the childcare center at Wesleyan University in Connecticut. The philosophy and size is very much like SCC. Susan has always believed that children learn best when the learning environment is designed to meet the developmental needs of each child and one that encourages exploration, creativity and independence. The role of the educator is to design the environment that provokes an understanding of new concepts and to interact with children in ways that develop language, thinking skills and a love of nature. She has had the pleasure of being a director for about twenty-seven years in four different programs. Susan and her husband, Chase have been building a house in Center Sandwich for the past five years. They have done the majority of work themselves. They have two grown children and a six year old granddaughter who totally has Susan wrapped around her little finger. Center Sandwich is a very familiar spot to Susan as she summered on Squam all her life. Outside of SCC Susan enjoys hiking, gardening, cooking and spending times with family and friends. 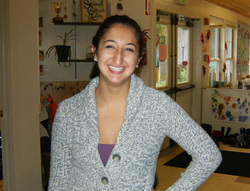 Shayna comes to SCC from Bearcamp Valley School and Children's Center, where she was assistant director. She enjoyed administrative work but is thrilled to be back in the classroom with children. "I love to see their faces, their adventures," she says. "Seeing them on a daily basis, you get this really good relationship with them." Shayna joined SCC in 2012 and has an associates degree in early childhood education. Outside of work and family she enjoys photography, kayaking and hiking. Corey has her BS in Early Childhood Education which she received from Granite State College in Conway, NH. Corey joined SCC in 2010 and has been here off and on throughout that time and now. She has two lovely children that her and her husband love spending time with. They love to go swimming, kayaking, Nordic skiing and hiking. Corey also brings her expertise in Yoga and gardening to SCC. She loves showing the children how to do yoga and reading and laughing with them. Judy has worked with children most of her life, beginning as a teenager teaching skiing, later serving in Christian ministry positions, raising 2 children, and having 6 grandchildren. She has worked with children in preschool, and school age in a before & after school program. Judy has earned her Associate’s Degree from Granite State College, and has an additional 12 credits in Early Childhood Education. She’s currently working toward her State of NH Credentials. She plans on continuing her education at Granite State College. Her household is full and busy with her husband, daughter, four grandchildren, two dogs, four cats, and any other teenager that happens to be around. Jess has a BS in Business Management from Plymouth State University. Her first connection to SCC came in 2009, when she worked as a teacher's aide while she was in high school. Jess joined SCC full time after college and still jumps in to any classroom that needs a helping hand. "It's such a close-knit community here, with all the families that I've known for so long," Jess says. In her free time, Jess enjoys hiking, fishing and doing renovation projects on her house. Nancy is a retired early childhood educator. She has worked in a variety of settings during her 25+ years in the field of education. Nancy has her Master’s Degree in Early Childhood Education from Wheelock College. Nancy began substituting for SCC in 2015. “I love being in the classroom with children and seeing their happy smiling faces as they explore their environment. I have always believed in the philosophy that children learn through their play. At SCC, they are given the opportunity to learn from nature which is so important to help spark their creativity and imagination.” Nancy enjoys traveling with her husband and visiting their 3 grandsons in Portland, Oregon. She loves boating and enjoys gardening and bird watching. She is an avid reader and beginner knitting enthusiast. Sally has her Bachelor’s degree from Boston University and Masters from Wheelock College and has taught Early Childhood and Special Education for over 25 years. Originally from Massachusetts, Louisiana and New York; she finally settled in Moultonborough to raise her family. Now living in Wonalancet, she spends most of her free time hiking, playing tennis, and traveling. She loves watching children learn and discover the world around them, through hands-on exploration, and play, storytelling and music. life teaching children and families. Karyn has a BS in Early Childhood Studies with a minor in Child Development from Plymouth State University. She also attended Manchester Community College for Childcare Administration and Management. She says, "I am honored to give the children a new experience every day, whether it be in the arts, science, music or natural world. I love being outdoors, so whenever we can, that is where we are, gaining a great familiarity with and respect for the outdoor world. My goal is to bring nature, science, art, music and a sense of community and family to each child who comes to the Center." Outside of work, Karyn enjoys writing fiction, drawing, wood burning and spending time with her family. Sarah has worked in Early Childhood Education for a number of years and has been with Sandwich Children's Center since 2008, first in the infant/toddlers room and currently as Lead Teacher in the preschool room. She has an associates degree from New Hampshire Community Technical College in Nashua, NH. Sarah also served for four years in the United States Marine Corps. Sarah says, "I am passionate about helping children learn and grow by exploring nature and the community around them. Things I enjoy outside of work are spending time with my family, camping, kayaking, snowmobiling, and playing softball." Dynasty returned to SCC in 2016 after a year away with her family in North Carolina. She is very excited to be back where there is emergent curriculum and staff that love spending time with the children. She studied at White Mountain Community College where she has received 19 credits in Early Childhood Studies. She plans on returning to take a couple more classes so she can earn her Associate's Degree. "I really enjoy watching them grow and being a part of their lives, and helping them learn through their play." Dynasty enjoys spending time with her husband and two little girls. They love to go hiking, swimming, spending time outdoors and doing arts and crafts. Louise comes to SCC from Community Nursery School in New York where she was a Lead 4's Teacher since 2013. She feels privileged to also have had the opportunity to teach for the past 12 years in New York, Miami and Maryland (outside Washington, DC). Louise recently moved to Moultonborough, fulfilling a lifelong dream to live in the Lakes Region after spending every summer here since she was born. She possesses a M.A. degree from New York University's Steinhart School of Education and a B.S. degree in Public Relations from Syracuse University's Newhouse School of Public Communications. "After spending much of my childhood exploring around the woods with my Dad, collecting insects and rocks, catching salamanders and enjoying singing under shady trees, I am so happy to be at SCC and share my passion for being outdoors with the children in such a unique nature- and art- based environment." Louise says. Previous to her teaching career, she worked 10 years in NYC as an international PR account executive traveling all over the globe, then spent another 15 years in Miami as a certified Therapeutic Recreation Specialist (CTRS) and director of Alzheimer's and Adult Day Centers. Louise also started the first Program of All Inclusive Care for the Elderly (PACE) in the state of Florida. She is bi-lingual in English & Spanish, lives on Long Island and has two sons in college. Outside work, Louise loves to sing, garden, hike, kayak, sail, swim and be a stand-up paddleboard (SUP) instructor in her own business - Paddleboard Winnipesaukee/Winnisquam every summer. Katie graduated from Inter-Lakes High School in Meredith in 2017. She is currently attending NHTI for the Early Childhood Education program, and plans to continue her education at Plymouth State University to earn a Bachelor’s degree, as well as a teacher certification. Katie says, “I am so thankful that I have the opportunity to help the children of SCC grow and explore the world around them each day! I am so excited to be a part of the incredible teaching team here at SCC.” In her free time, Katie enjoy kayaking, baking, and spending time with family and friends. Keely joined SCC in 2018 as a Teacher’s Assistant. She is currently attending Lakes Region Community College to get her Bachelor’s Degree in Early Childhood Education. Keely hopes to pursue her passion for teaching and to eventually become a Kindergarten teacher. Keely’s love for children and teaching comes from her large family of ten siblings. ”Just seeing their smiles and reactions when they accomplish something they are proud of gives me happiness knowing I got to share that moment with them” Keely says. In her free time, Keely loves hiking, skiing, kayaking, and enjoying the outdoors. She loves traveling and discovering new adventures. Mariah joined us in 2018 as our new School Age Coordinator. Mariah was born and raised among the Cascade mountain range of Washington State. During her high school years, she moved east to a coastal town in East Lyme, Connecticut. From there, she went to Wheelock College in Boston, MA to earn her Bachelor’s Degree in Social Science and Elementary Education. After receiving her degree, she received a rare opportunity to explore the California coast, working as a crew member in the squid fishing fleet. After two years of living on the boat, she gravitated back to the comforts of Sandwich to be close to family; eager to pursue her career in education and share her passion for adventure and the outdoors. Tawnya has a BS in Developmental Psychology from Plymouth State University. She has been at SCC since 2010 and has been in her current position since 2015. Working with children has always been a passion and she enjoys helping create a caring and loving environment in which children can flourish. Abbie has a BA in theater from Messiah College in Pennsylvania, where she also received six credits in early childhood education. She recently took Foundations for Early Childhood Studies through UNH online services where she recieved another 3 credits in ECE. She worked with children at her church during college and joined SCC in 2015. "I've loved kids all my life," Abbie says. "Their excitement about life and everything is just contagious!" Abbie also works for Sandwich's theater company, "Advice to the Players," as a stage manager, educational program assistant and summer camp assistant. In addition to kids and theater, she enjoys hiking with her golden retriever, snowboarding and swimming. Brady Alosa, grew up in Lewiston, Maine with her parents and two brothers. She attended the University of New England and graduated with a BA in English/Women’s Studies. She also attended the Audubon Expedition Institute in Cambridge, MA at Lesley University. She came to New Hampshire when she took the position as Farm Manager/Educator at the Community School in Tamworth, NH. She led Harvest and Garden classes, provided educational opportunities for apprentices, managed student workers and volunteers and was also the Faculty representative on their Board of Trustees. She planned and documented field and crop rotation, co-planned farm and school events as fundraisers and created seeding and planting schedules, just a few of the many hats she wore. She was also an Educator at the Remick Country Doctor Museum and Farm as well as a Lead Teacher for the Upper Elementary at the Robert Frost Charter School where she implemented curriculum which included Montessori and project-based learning pedagogies with the common core standards of public school education. She lives with her husband, son and two stepsons plus their dog Nymie or “Sistah” to her son in Sandwich, NH. She loves spending time with her family, being at the ocean, growing food, and reading books. Barbara began substitute teaching in elementary and preschool classrooms in 2012. She volunteered in Montessori classrooms before that, when her children were in preschool. She believes in providing the basic materials, then supporting children's built in curiosity in preschool and early grades. Since retiring with her husband to Sandwich in July 2015, Barbara has appreciated SCC's approach to letting children learn by playing, and each child being allowed to challenge them self at their own pace. Barbara holds a Bachelor's degree in Computer Science, programming for years before raising their three children in Massachusetts. She enjoys gardening, knitting, reading, and day hikes with her dog.